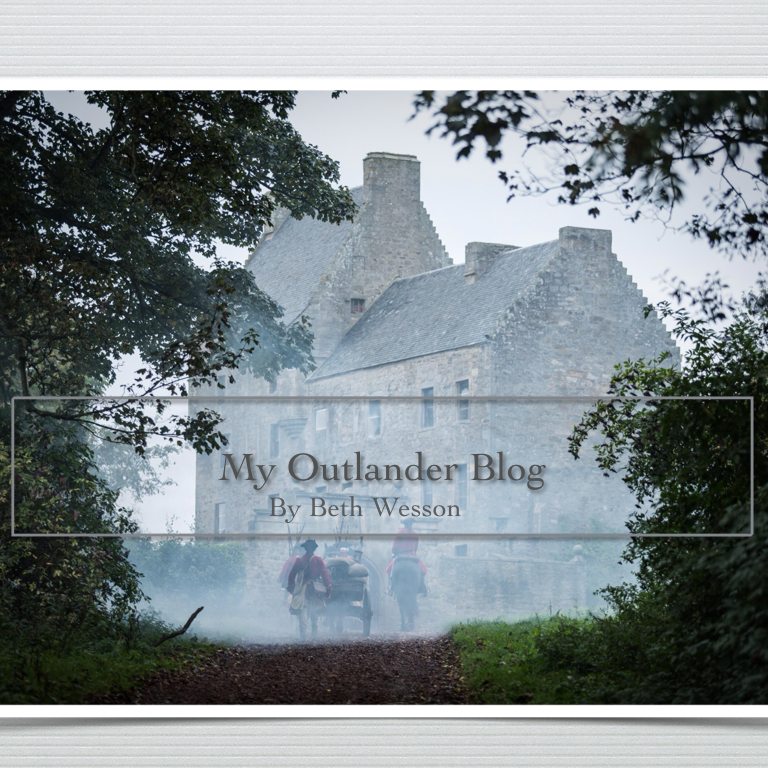 The One Where I Was a Fly on the Writer’s Room Wall…Outlander Episode 14 – My Outlander Blog! It strikes me as ironic that just about the time the series is over, I’m finally starting to understand this adaptation stuff! One of the many reasons that I love Diana Gabaldon’s Outlander series and her writing style is the amount of rich detail she uses. In her books, I have learned everything from how to keep and store a cadaver to how to make blood pudding. Her descriptions of what it feels like to give birth or put your hand inside a live body or watch a beautiful man sleep naked among the ferns while an ant crawls across his hand are written so descriptive that isn’t hard to imagine what the character sees, hears or feels and I find myself lost in her stories as a result. But, sometimes …she leaves things to the readers’ imagination (like a good writer should) and I’m starting to see how that fact might play out in the Outlander on Starz writer’s room. Like many of Diana’s long-time fans, I’ve had the singular experience of watching the whole TV adaptation unfold from the first day she announced that the series was a go. What a wonderful time we have had interacting with the folks creating the show. Over the past year or so, I feel like I’ve gotten to “know” some of the creative folks helping to make our beloved books and characters come to life. We’ve had a chance to ask them questions, read their tweets and as a result, gotten to know a little bit about what they do and something of their individual personalities. So, I’ve decided that in this article, I’m taking creative license and writing my own screenplay…about what I think might have happened in the Outlander Writer’s room when they were creating this episode…..
*Producer’s note: (that’s me! Giggle, snort!) I really don’t know if these things were ever said or who might have said them. It’s based on my experiences “interacting” with Ron, Maril and Matt over the last year that guides this bit of guessery! Setting the scene: A room with folding tables their tops scattered with paper and resource materials and the remnants of assorted beverages. At least three writers, Ron, Matt and Maril are sitting in various states of contemplation as they stare at a wall full of chronologically posted dialogue from Diana’s book. They are discussing how to write episode 14 “The Search”. Ron: Okay…we’ve got two women striking out on their own to rescue a man they both deeply love…a devoted sister and a desperate wife. Matt: It makes sense to follow the chronological order here, in fact, I think we have to. The arc for this episode isn’t going to be hard to figure out, it’s all there. Ron: Agreed. Now, let’s start by discussing these women. They are not going to have the benefit of superior strength or intimidation that a male might be able to use in this situation. They aren’t going to over-power anyone. Ironically, it is their femaleness that is their best weapon. Maril: Might be fun to play with the interrogation. Diana doesn’t give us a lot about that scene other than they made it uncomfortable enough that he told them what they wanted to know. Now what would that look like? Ron: shrugs Good cop, Bad cop? Matt: Ohhhhh…I like that…Claire, of course, is the good cop convincing the prisoner that Jenny is just a hair-trigger away from doing him some real damage! Maril: Which she probably is! What could she do to him…..? Matt: ….and, he prevents the women from having to commit murder. Maril: Murtagh is one of my favorite characters. His devotion to Jamie! Diana doesn’t tell us a lot about him. He’s always portrayed as quiet, dour, serious, a bit of a mystery really. Ron: LOVE his devotion to Jamie and… how Claire might be the only one who really knows why Murtagh is so devoted. The viewers are going to love finding out about the bracelet connection. We have a chance to develop Murtagh’s character here. He and Claire working together is an interesting dynamic. Matt: Nodding Yeah, it is! Love how Diana had Murtagh devise a plan to find Jamie. They have no idea where to look, so they are trying to help Jamie find THEM by making themselves the talk of the Highlands. They travel from village to village exploiting their skills to call attention to themselves; Claire’s healing, fortune-telling and Murtagh’s singing. chuckles Does anyone know if Duncan can sing? Or Cait? Maril: laughing I think Cait can and I’m pretty sure I heard Duncan can’t. Going to have to find another skill to highlight. Dancing? Ron: Diana left a lot to the reader’s imagination with the visits to the villages. We could really run with this. 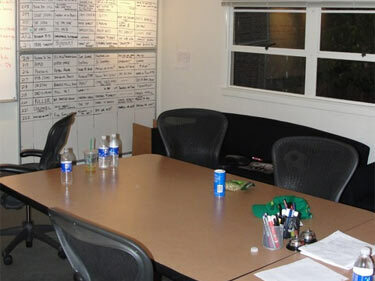 They stare at the wall for a while and then suddenly Matt begins scribbling madly on a piece of paper. Matt: Okay, okay listen to this. Reads from his scribbles What if we DO go with dancing? Murtagh doing the sword dance, but here’s the thing. He isn’t any good. They boo him. Throw vegetables at him. It would highlight the lengths he is willing to go for love of Jamie. The serious dour man allowing himself to suffer the indignity of dancing in front of a crowd. Maril: warming to the idea I like it! The women had to step outside their comfort zone to rescue Jamie and so does Murtaugh. But, how about this twist? He thinks he’s good! Ron: Laughing It has a whole “Shakespeare in Love” vibe. Actors acting about acting and performing. Nothing’s really changed has it?! They laugh at Claire getting comfortable with her performing and Murtagh’s anger at their audience’s obvious lack of appreciation for superior dancing skills. They rapidly add ideas to the pot including nods to 1945 and Claire’s new performance incorporating a song Jamie would recognize. Matt: …And…the gypsies. They play an important part in this. Maril: There wasn’t much about that in the books either. Ron: Gypsies?! How great is that going to be? What are gypsies famous for? More discussion insues and they decide that the gypsies steal the Sassenach song and complicate things for Claire and Murtagh. Maril: …so, that’s how Jamie gets caught. He follows the song right into the path of the Redcoats. RON: …and that leads us to the scene with Dougal. I think we can stick pretty close to what Diana has written. It’s a great scene. Powerful and a bit shocking. Not liking Dougal much in this scene. The group continues to do what they do best…look at the source material and adapt it for a visual medium trying always to bring the story back around to where it needs to go. I ‘m sure this process takes hours and not just bit of argument. Hence the need for drinking and naked Twister afterward. So, this is what I imagine goes on in the Outlander’s screenwriter’s room. This episode made a rather vague area of the book fairly pop with intriguing possibilities and images and still brought the story back to where it needs to go. I get it. And … I. Love. It. Congrats on an interesting flight of imagination. I’m sure we’d all like to be that fly on the wall once in a while. Interesting concept for your post. I think the writers room would have been full of flies if fans had their way. I was always a little bit in awe of book Jenny and am feeling the same for tv Jenny. Just had a baby, rides off on a horse with a take no prisoners attitude. There were a lot of shots with horses galloping off in all directions this episode. Must have been difficult to shoot. The puppet show was lovely. The fairies, the monolithic stones and the song the puppeteers sang sounded the same as the Leoch Bard sang about the women travelling to another land. I may be mistaken about the song, but it sounded very similar. Yes! The song was the same! And yes loved both book and show Jenny! If you’ve got the time, watch ep 14 with the sound down and listen to Ron and Matt’s comments. They filmed most of the ep on one estate – saved lots of money and time. They stuck Claire in man’s clothes because in her period clothes her pottie breaks took 40 minutes. The cave on the beach was actually in the studio, repurposed thieves hole! The puppet maker had butterfly wings she had saved for years waiting for a very special purpose, and she used them on the fairie puppets. I love how you put everything in the hands of the writers. But I have something in my head. We Know what Dougal has done in the past and Clarie reveals what is in his mind to take Lallybroch. So here comes my thought… would be possible that Dougal leaded the red coats to find Jaime and in this way he could put him away forever? Oh, don’t you just hate it when the outside world actually does non-Outlander watching over the weekend? Regarding advance access: sort of late in the season, but you can watch it online on StarzPlay sometime after midnight Friday night. Not sure of the exact time and time zones’ effects but give it a try for the last two episodes. You know, speaking of Dougal; as a war chief (and obviously a well-respected and effective one), I’ve wondered why he was so blind to the dangers of supporting the Jacobites against the English. He had to know the history of previous attempts and he certainly would be aware of the strength and resources of the Redcoats. But Dougal was always ALL IN! Your review was actually very pleasant and refreshing compared to the others “out there.” I, too, loved the episode and felt it was certainly a lull before the storm upon our senses in the last two episodes. Your “take” on the various episodes is just a joy to read. Such a sweet way to characterize this ep. I enjoyed the episode and really like the confrontation with Dougal. Graham was fabulous in that scene. My favorite was the scene with Murtaugh in the cave. I loved that Matt had Murtaugh say that Jamie’s “a son to” him instead of saying that Jamie was “like” a son to him. I like that distinction! Personally, there could have been a little less “performing” and I’d have been okay with it, but like you, I appreciate the adaptation for what it is and think this ep had the right tone as a lead into Wentworth. Finally, I wish Rupert had more lines!! I could listen to Grant O’Rourke speak for hours! 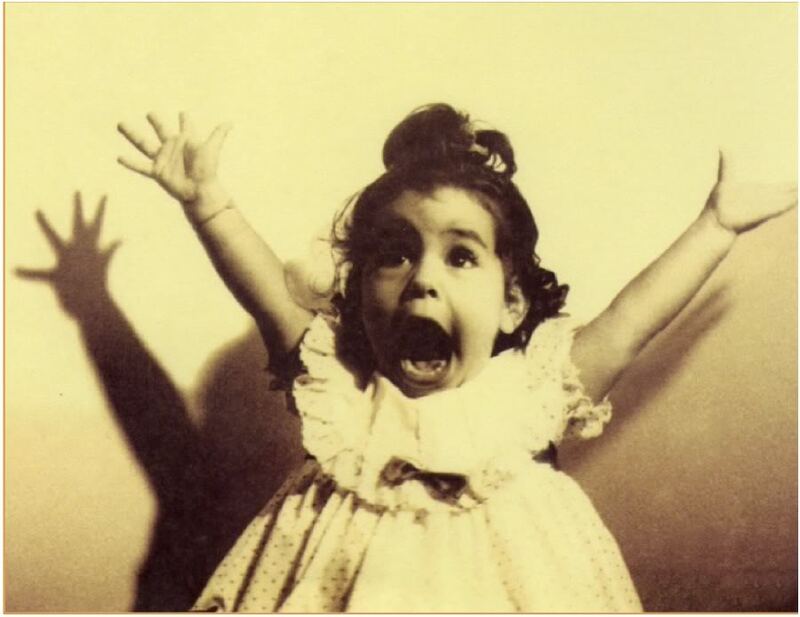 Thanks Beth, as always for your great posts! Ha ha! Not used to this phone! It’s GGW, not GGE! Love this post, Beth. Not my favorite episode overall, but I loved the Jenny & Claire posse. Those two actresses just work so beautifully together. I could watch those first 20 minutes over and over. In fact, I think I will! What a wonderful post. I love your imagination as much as I love your writing. Well done! I thoroughly enjoyed your review. I have loved every episode for different reasons and glad to hear from folks who are watching for the whole story and not just the “naked” scenes (which are great also, but alone, don’t hold up a series of books or TV). Sorry you couldn’t sleep but I am grateful with the result. Thank you for this. I got so tired of everyone writing where was Jamie. I got tired of the I don’t like this episode. Of course each is entitled to their opinion so here’s mine. Claire is the “star ” of the show. The story is principally about her. Yes, Jamie is a great character and Sam is a nice looking man but enough already. Ok rant over. I loved the scenery in this episode. I loved the dancing, singing Claire. Nothing will ever replace the books for me but I like this adaptation very much. Yes! I always remember Cait saying “we aren’t taking your books away. Just consider this a companion piece”! Thanks for reading!